Can Introverted Leaders Be Assertive? Mary Barra is the CEO of General Motors. As a young engineer, she confronted an assembly worker who directed a wolf whistle in her direction. “What are you doing?” she asked. He was trying to attract her attention, he told her. She requested that in the future he do that by saying “Hi.” This simple yet assertive statement resulted in more respectful greetings from him, and according to Barra, the catcalls from other men in the plant diminished. Being an introvert, as Mary Barra is, shouldn’t limit your ability to assert yourself. In fact, introversion and assertiveness are a perfect combination. 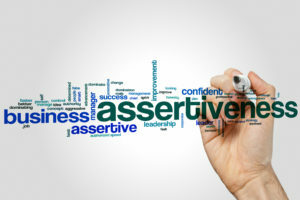 Assertiveness is often incorrectly confused with aggressiveness, but assertiveness is characterized by mutual respect and clear, open, and honest communication. Aggressive behavior, on the other hand, is disrespectful and shuts people down. Introverts show us that you don’t have to yell to get what you want. In my research on genius opposite pairs of workplace introverts and extroverts, the introvert’s steady, intentional, persistence often made the difference in their success. On one sales team, introverted Brian stood in the back of the room, quietly checking in with prospects and responding to their questions. His louder, extroverted teammate, Audrey, made an exuberant pitch from the stage. Brian was assertive by following up with his key target customers for months and, in some cases, years. He closed most of the deals with his persistence and follow through. In a more well-known example, Rosa Parks, a 42-year-old seamstress and civil rights hero, exhibited true assertiveness when she made the decision to go against the law and sit in the white section of the bus in Montgomery, AL. Her quiet courage led to a widespread bus boycott that ultimately struck down the segregation laws on buses throughout the land. The boss wants you to work late for the third time this week. It could be time to say, “No, I can’t, because I have commitments at home.” As mentioned in the earlier example, let’s say you believe you deserve a raise. You persist in following up with your “ask,” even when turned down the previous quarter. When someone takes credit for your work on a project, you can be assertive and tell your team that it was your original design. There are countless opportunities to speak up for yourself. Introverts like GM’s CEO Barra have pushed themselves and developed their skills in this area by practicing and pushing themselves to speak up. It is not always easy. Figure out when it is important to set boundaries and find ways to express yourself that are respectful, yet firm. As a leader, assertiveness can also be a way to advocate for employees. Melinda Gates, the co-chair of the Bill and Melinda Gates Foundation, makes a point of speaking up in support of female colleagues “when a man restates something that a woman already said or talks over her at a meeting.” And she calls herself out when she falls into that behavior herself. You can also support introverts on your team when they don’t feel comfortable asserting themselves. Bill Stainton, a professional speaker, and Emmy award-winner was chairing a professional board. He tells the story of failing to ask Lucy, an introverted board member, more about her background and skills. After she finished her board term, he discovered she had a goldmine of expertise in an area that would have been helpful in growing their organization. Bill considered it a large, missed opportunity. After that experience, he has made it a point to learn more about the strengths of the people he is working with, especially when they don’t freely self-disclose that information. So by understanding what assertiveness vs. aggressiveness looks like, turning to other introverted leaders for examples and setting the stage for introverts on your team to be heard, you can act assertively in the way that works for you and get results. This entry was posted in Uncategorized on August 23, 2017 by Jennifer Kahnweiler. I have had the privilege of working with Jennifer Kahnweiler for the past two years. She is an engaging and competent speaker. Jennifer is polished, professional, and confident. I consistently called on Jennifer to provide training for my high profile customers. My customers are always satisfied with her trainings and often request her by name.